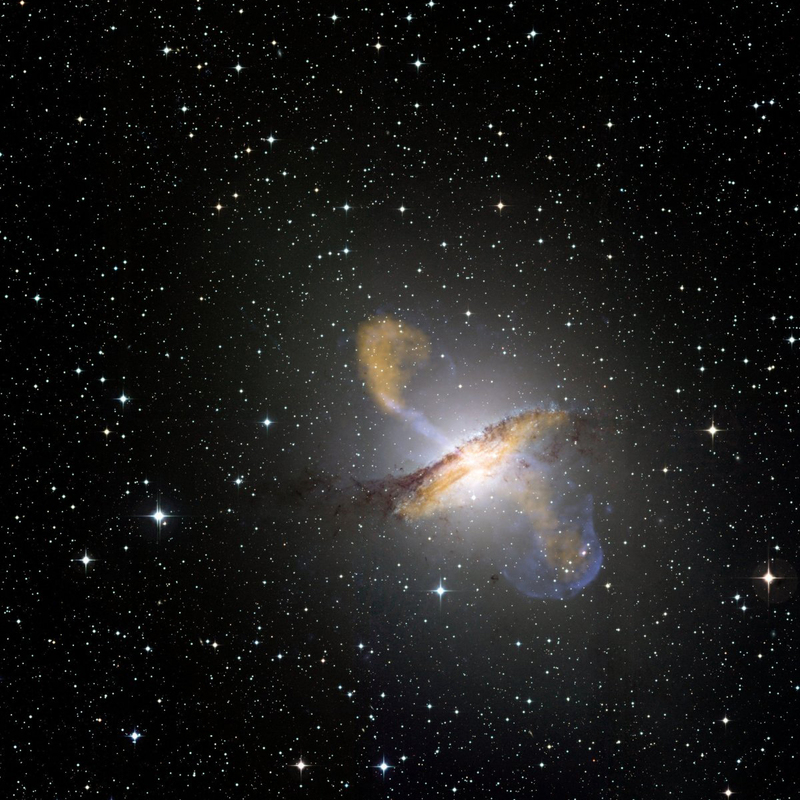 Centaurus A is a nearby galaxy — at 13 million light years distant, only a handful of big galaxies are closer to us. And it’s weird: it’s an elliptical galaxy eating a spiral! They’re in the last stages of merging into one bigger and messier galaxy. Dust from the spiral forms a huge ring around the center of the galaxy, with the gas and dust from both galaxies being dumped into the core. But at that core is a supermassive black hole, gobbling down the matter as fast as it can… and even that’s not fast enough. The material piles up around the black hole, forming a superheated disk which helps channel all the vast forces in play around it. The end result is two corridors, twin tunnels leading up and away from the poles of the disk. Material heated to millions of degrees blasts through these paths, creating beams of matter and energy screaming out from the black hole. And we have a front row seat. Centaurs A, erupting. Click for a much larger, cooler version. This new look at Cen A is a combination of three different telescopes in three different wavelength regimes: visible light from a 2.2 meter telescope in Chile, X-ray from the orbiting Chandra Observatory, and sub-millimeter emission (basically high-energy radio; if it were on your radio dial it would be off the scale to the right) taken by APEX, a 12 meter telescope located in the high desert in Chile. The composite image is false color. The visible light (shown in more or less true color) is from stars and gas in the galaxy (and foreground stars in our own galaxy). The blue is from from Chandra, showing high energy X-rays. See how the jets are blue near the center? When they erupt from near the black hole they have tremendous energy and glow in X-rays. Measurements of how the gas is behaving indicate that the gas is moving outwards from the core at half the speed of light. The new bit is the orange, which is from the submillimeter emission. That comes from cooler, less violent regions. That includes the ends of the jets, and the ring of dust circling the colliding galaxies. The jets slow as they ram gas outside the galaxy, and eventually puff up and stop. As they do, they emit much longer wavelengths in the radio and submillimeter region, where the new APEX instrument is sensitive — and this is the first time this part of the jets has been seen in this wavelength. Interestingly, the rammed gas at the tip of the bottom jet is glowing in X-rays, meaning a lot of activity is still going on there — you can see the arc of the shockwave. The density of gas in that area is much larger than "above" the galaxy, which is why you can see it better. The ring of dust is interesting as well. It’s easy to see in visible light, too, as a dark band blocking light from stars closer to the galaxy’s center. All that gas disturbed by the collision is forming stars at a very high rate. Those stars pour out dust, which is warmed by the starlight. Warm dust emits lots of submillimeter light, making it obvious to APEX. At the very heart of the galaxy, as material pours into the black hole, a fierce amount of energy is emitted. That can be seen as the starlike point right smack dab in the middle. We see it in all three wavelengths, which is why it looks so bright in this image. Cen A is a funny study in contrasts. Galaxy collisions on this scale aren’t common, so it’s nice to have one so close; statistically that’s rare. The collision has made a complete mess of things, so it’s good we can see it from close by; we get more details that way. But it’s so messy it’s hard to say what’s going on exactly! We have a decent idea in general, but specifics can be hard to nail down. That’s why looking at it with many different telescopes helps so much. If we only had visible light telescopes, we’d miss the jets of matter. If we had only X-rays we wouldn’t see the stars and the dust ring. If we had only radio or submillimeter we’d miss the high-energy action going on. Like in the blind men and the elephant parable, we need to take all the information we have and combine it to get, literally, a complete picture of the scene. With APEX added to our inventory, we’ve added new pieces to the puzzle, and that always makes it easier to solve.